The Armed Forces Community Covenant is a voluntary statement of mutual support between a civilian community and its local Armed Forces Community. It is intended to complement the Armed Forces Covenant, which outlines the moral obligation between the Nation, The Government and the Armed Forces, at the local level. 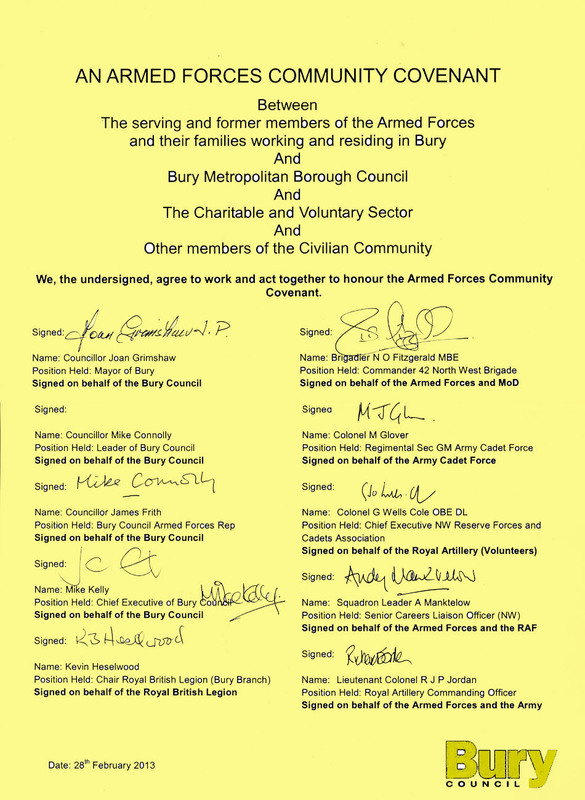 The purpose of this Community Covenant is to encourage support for the Armed Forces Community working and residing in Bury and to recognise and remember the sacrifices made by members of this Armed Forces Community, particularly those who have given the most. This includes in-service and ex-service personnel, their families and widow(er)s in the Metropolitan Borough of Bury. For Bury Metropolitan Borough Council and partner organisations, the Community Covenant presents an opportunity to bring their knowledge, experience and expertise to bear on the provision of help and advice to members of the Armed Forces Community. It also presents an opportunity to build upon existing good work on other initiatives such as welfare pathway. For the Armed Forces Community, the Community Covenant encourages the integration of service life into civilian life and encourages members of the Armed Forces Community to help their Local Community. 1. To establish a single community point of contact together with the Bury Metropolitan Borough Council one stop shop that leads to both a self referral welfare pathway and a welfare support pathway for serving and ex-service men and women, their dependants, families and widow(er)s.
2. Working with the Housing Associations and other agencies to provide and support on housing matters and ensure that priority for accommodation is given to Veterans. 3. To establish and maintain a close relationship with the Regular, Reserve and Cadet Units stationed in the area. To carry out measures to ensure that they are welcomed into the Metropolitan Borough and that service personnel and their families are supported by all agencies -public, private, voluntary and charitable. 4. To establish a partnership with employers, specialist employment consultancies and agencies in Bury Metropolitan Borough that will assist Armed Forces Personnel to make the transition to civilian life. 5. To provide external support to former Armed Forces in HMP Forrest Bank and to respond to and co-ordinate any request for assistance. 6. To work together with NHS services in Bury Metropolitan Borough to ensure priority treatment to Armed Forces personnel and Veterans. 7. Co-ordinate mental health facilities both NHS and private to recognise and treat mental health conditions caused by time in service for serving and retired personnel and their families. 8. To promote awareness of the role and significance of the Armed Forces with Bury Metropolitan Borough by bringing together serving personnel, veterans, youth, schools, local charitable bodies and voluntary organisations. 9. By establishing a living heritage project to record and exhibit military experiences and increase awareness and appreciation of Armed Forces Service. 10. To run and co-ordinate events that enhance appreciation of the military ethos, enable fundraising for Service Charities, commemorate service and express gratitude for the commitment and sacrifices made by members of our Armed Forces. 11. Celebrate the freedom of Bury Metropolitan Borough with Royal Regiment of Fusiliers. This two-way agreement recognises the debt that we owe to those who serve, have served and will serve in our armed forces to protect us. Brigadier, Commander, Squadron Leader, We will encourage our young people to carry on the tradition of service, to go into harm's way under your leadership. When they return to us we will succour them, if broken in mind, body or spirit we will help them to recover. Those who have paid the ultimate sacrifice we will cherish and remember always. We will help our returning warriors to find work, be housed, have their children schooled and integrate into our lovely Borough. To those stationed amongst us we welcome you to take part in our many celebrations, fetes, carnivals and host of other activities, to walk amongst us in the Queen's uniform, become a significant part of our society. Visit our schools, enjoy our heritage. We pledge this day to forge a bond that will last. The Worshipful The Mayor, "I commend this covenant and ask that you sign on behalf of the Council".